Just because Sedona is located in the high-desert region does not mean that flowers from around the world aren’t available for a beautiful Sedona wedding. Weekly trips are made to Phoenix where Sedona Wedding Studio members, Events By Show Stoppers hand-select product for their weddings and events or in some cases, pick up specially air-freighted flowers at the Phoenix Sky Harbor Airport. 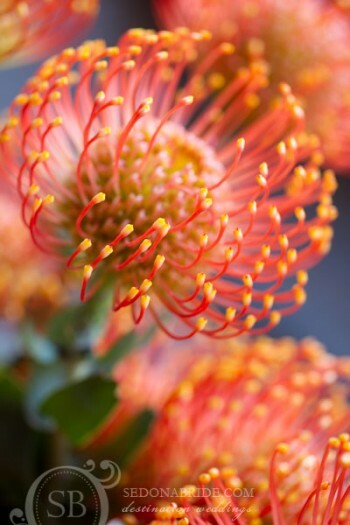 This “Friday Finds” one of our favorite Proteas, the Pincushion. 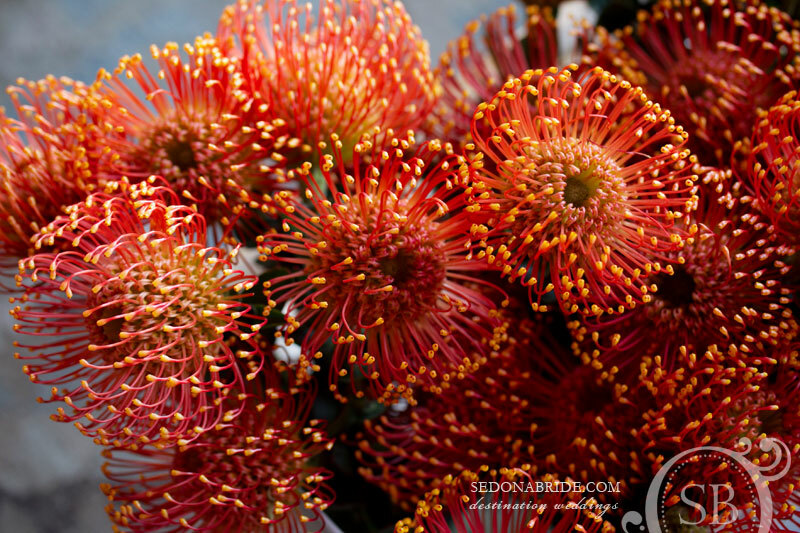 These exotic blossoms have the distinctive appearance of a pincushion filled with pins. Their spherical-shaped flower heads and unusual color combinations add extreme texture to floral designs. Show Stoppers loves using these wonderful blooms in floral designs and wedding bouquets. Often mistaken for tropical flowers, the exotic flowers are actually a grouping of multiple flower heads. Each “pin” is actually flower within itself with individual pollenating capabilities. Pincushion Proteas are native to South Africa and grow like hedges in dry, mountainous regions. They are cultivated in several places around the world such as Australia, Israel and the United States, making them pretty much available year round. They do mix well with succulents, cacti, as well as tropical designs. They almost look like a kind of sea-life. The Pincushion is available in many varieties and colors. The most common varieties are orange and / or yellow. For brides being married in Sedona who want something really different and artistic, the Pincushion Protea may be a great choice. Peak seasons are late spring and autumn when the flowers typically yield a much bigger head. Depending on factors such as weather and shipping costs, prices usually fall between 5.00 and 6.00 per bloom.